In the early 1800s, a number of publishers produced county directories, a sort of forerunner of the Yellow Pages, which have become a valuable source of historic information. 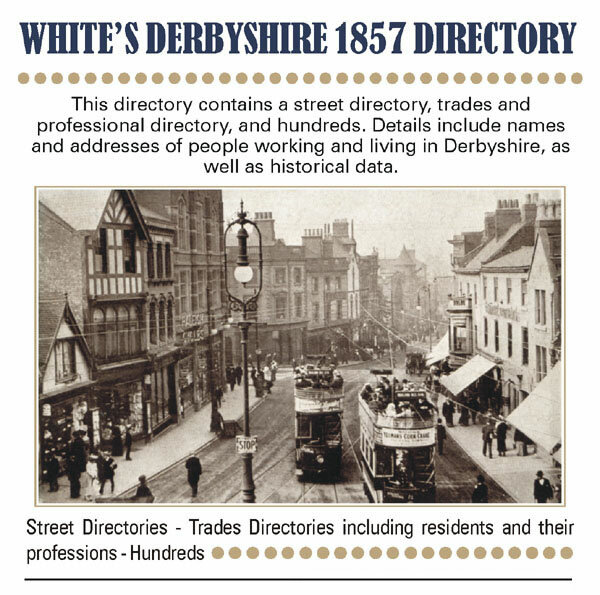 Among the most popular were Bradshaw & Parsons Directory of Staffordshire, Bagshaw’s Derbyshire Directory and White’s Directory of Derbyshire. BURTON-UPON-TRENT is an extensive parish, principally in the Offlow Hundred, Staffordshire, and partly in Repton and Gresley Hundred, Derbyshire. The entire parish comprises 7 townships, viz. : Burton-upon-Trent, Burton Extra, Branstone, Horninglow, and Stretton, in Staffordshire, with Winshill, and part of Stapenhill, which are in Derbyshire, with about 10,000 acres of land, and in 1851 had 2,250 houses, and 12,373 inhabitants, of whom 6,189 were males, and 6,184 females. The manor of Burton-upon-­Trent, with several hamlets, was granted in the 37th Henry VIII. to an ancestor of the present Marquis of Anglesey, who is lord of the manor, principal owner of the soil, and te impropriator of the great tithes of the whole parish. The east and west sides of the parish swell gradually into hills, and have a strong red loamy soil, suitable for the growth of barley and wheat, the former of which is extensively cultivated, and sold to the numerous malting establishments at Burton. The rest of the land is chiefly meadow, forming rich loamly pastures, which are often flooded by the waters of the Trent and Dove, which latter flows on the north side of the parish. A well-built market town of considerable antiquity, is pleasantly situated on the west bank of the Trent, which here flows in two broad streams, and is crossed by an ancient stone bridge of 36 arches, in the centre of which is a stone which marks the boundaries between the counties of Derby and Stafford. It is in 52o 53’ north latitude, and 1o 35’ west longitude, and is distant 11 miles S.W. of Derby, 13 miles N.E. of Lichfield, 24 E. of Stafford, and 125 N.W. of London by the road, and 129 by the railway. The town of Burton has been considerably improved during the last 25 years, several New Streets have been made, many old buildings removed, and handsome houses erected on the sites. The principal streets are, High Street, Horninglow Street, New Street, Station Street, Lichfield Street, and Bridge Street; the former is the principal thoroughfare, been well flagged and paved, and contains many handsome houses, shops, and excellent inns; it is of considerable length, and runs paralell with the river from north to south. In 1851, it had (including Burton Extra and part of Horninglow) 1604 inhabited houses, 50 uninhabited, and 22 building; with 7,934 inhabitants, of whom 3,943 were males, and 3,991 females. Burton has long been celebrated for the excellence of its ale, and immense quantities are sent to all parts of Great Britain, to many foreign countries, the East and West Indies, Australia, and to all parts of the world. During thc reign of the second Catherine of Russia, great quantities were exported to the Continent, it being the favourite beverage of that queen, but this trade was extin­guished by the Berlin Decree, which shut out our manufactures from the Continent, but the taste for pale ale has greatly increased in this country, and most of the brewers are now employed in supplying the home market. The first Brewery established here was in 1610, but 30 years ago the number was only 5, it is now 19; and a greater extent of business is done at some of the older establishments than was done by the whole town at that time. The superior properties of Burton ale is partly attributable to the excellent hard water which is obtained from the neighbouring hills; and Dr. Darwin ingeniously supposes that some of the saccharine acid in the malt combines with the calcareous earth of hard water, and forms a sort of mineral sugar, which is convertible into spirits. Most of the breweries have also very extensive malting establishments, the consumption of which during the season, 1855-56, amounted to 1,216,000 bushels, of which quantity 704,000 bushels were made in the town. The cotton spinning and power-loom weaving were carried on to a considerable extent by Messrs. Peel & Co. till within the last few years. One of the factories is now occupied by Mr. John Taverner, tape manufacturer; another is used as stores by the brewers, and the others are unoccupied. There are also three Iron foundries, and an Engineer and Millwright’s establishments here. The river Trent is Navigable for barges up to the town, and the canal, which connects that river with the Mersey, opens a water communication with all the principal towns in the kingdom. The town has several times been inundated by the Trent, particularly in the years 1771, 1792, 1795, and 1798, when most of the streets were laid under water. The New Sewer, formed in 1843, is a very great improvement to the town of Burton, and has effectually removed those continual nuisances so detrimental to the health and com­fort of the inhabitants. Previous to the year 1788, High Street was not paved, nor had it a sewer of any kind, and the centre of the street was so low that it fanned a general receptacle for the refuse water from all the houses. At intervals, stepping stones were placed to enable persons to cross. In that year, an act of parliament was obtained for paving, repairing, cleansing, and lighting the town, and for removing and preventing nuisances, soon after which, a sewer of about two feet diameter was formed from the Bridge to High Street, but not being properly constructed, was continually stopping up for want of a regular fall. In 1843, however, it was determined to employ an engineer to see how far it was practicable to carry out the sewerage, so as effectually to drain the town; the result was satisfactory, and the Feoffees liberally responded to the wants of the town, by a grant of £400. The sewerage extends a distance of 2,159 yards, and the most sanguine expectations of the projectors have been fully realised. Each time a boat passes into the lock, which may be estimated at 12 times a day, the lock full of water is turned down the sewer, from Bond-end Wharf to the Bridge, by which means no filth can possibly accumulate, or offensive effiuvia be omitted. The Town Hall, in the Market Place, is a commodious structure, created in 1772, by the late Lord Paget, father of the Marquis of Anglesey, the present owner of the manor, to whose ancestors it was granted in the reign of Henry VIII., and all such privileges, liberties, and franchises belonging to the same, as had heretofore been enjoyed by the abbots of Burton. In the exercise of these privileges, the lord of the manor appoints a steward and a bailiff, who retain their office during his pleasure. The steward presides as judge in a court for the recovery of debts under 40s., called the Genter’s Court. This court was judicially acknowledged by the Court of King’s Bench, on an informa­tion in the nature of a quo warranto, brought by the attorney-general in the reign of Queen Elizabeth against Thomas, then Lord Paget, who claimed the same as a prescrip­tive right in the abbots of Burton beyond the memory of man. The Genter’s court is held in the Town hall every third Friday, and has exclusive jurisdiction over the manor. The bailiff, John Richardson, Esq., in right of his office, is coroner; he has also a concurrent juriadiction with the county magistrates as a justice of the peace, but being a practicing attorney, he does not act in that capacity. In addition to the Genter’s court, the lord of the manor annually holds a Court leet and view of frank-pledge, at which the election of officers takes place, among whom are six decimers, and three constables. The Market is on Thursday. Here are four annual Fairs—held on Candlemas day, April 5, Holy Thursday, and October 22 to 29. The latter was granted by King John, and is noted for the sale of horses and cheese, A Hiring for servants is held on the Monday after New Michaelmas day, and a Feast on the nearest Sunday to Street Modeven’s day. Races were formerly held here, but have been discontinued some years. The Gas Works, in Station Street, were erected in 1832 by a proprietary of £20 shareholders, at a cost of £2,500, and were leased at that time for a period of 21 years, to Mr. Samuel Sanders, since which period they have, by an act of parliament, come into the hands of the Town commissioners, who, in 1854, erected New works, in Anderstaff Lane, the original works having become too small for the requirements of the town. The Birmingham and Derby branch of the Midland railway has a convenient Station on the west side of the town, and communicates with the North and South Staffordshire, the Burton and Leicester and other lines. The Bridge is the most interesting object of antiquity which the town possesses, and is supposed to have been erected by Bernard, Abbott of Burton, about the year 1174; others assign the erection to a much earlier period, Its zig-zag form stretches across the two steams of the Trent, and the adjoining low meadows, which are subject to inundation, a distance of 1,545 feet, and has 36 arches, three of which are entirely blocked up, and five more of them are only visited by the water in the time of floods, From its extreme narrowness and unnecessary length, many serious accidents have occurred, and it is a matter of consideration with the inhabitants how the danger shall be obviated. A battle was fought upon the bridge in 1322, when Edward III. obtained a decisive victory over the Earl of Lancaster; and it is supposed that the chapel which formerly stood at the end of the bridge was built to commemorate this victory. Mass was frequently said, in order to raise funds to defray the expenses of the bridge. The Abbey appears to have been a place of some magnitude, from the few vestiges that are still to be seen. Tanner says: Ulfric Spot, finished and endowed, A.D. 1004, an abbey here for monks of the order of Street Benedict. It was dedicated to the blessed Virgin Mary and Street Modoven, and valued 26th Henry VIII., at £267 14s. 5d. per annum. But on the record in the first fruit’s office, the yearly valuation of this monastery is given at £501 7s. The Abbey and its dependencies were exempt from all exactions, duties, and services, except trinodas necessitas, the erection of fortresses and bridges, the repairing of highways, and the repelling of invasions. The abbot and convent surrendered this house Nov. 14th, 1539, and in 1541, Henry VIII, who, after robbing it of part of its estates, refounded it as a Collegiate Church, dedicated to Jesus Christ and his mother Mary; and granted for their support, the manor of Burton, and thirteen other manors, & Co., belonging to the monastery. This Church was but of short continuance, for it was dissolved in 1545, when all the lands and endowments of the same then worth £356 16s. 3d. per annum were conveyed by the said king to Sir William Paget, an ancestor of their present owner, the Marquis of Anglesey. The seal of this college is one of the most beautiful specimens of that style of engraving now extant. It represents our Saviour and his disciples at the last supper, with the arms of Ulfric, the founder, at the bottom. On the margin is a Latin inscription, signifying it to be. The common seal of the dean and chapter of the collegiate church of Christ, at Burton-upon-Trent. Several abbots, at different periods, were re­turned as members of parliament, and they were empowered to hold a weekly market, collect tolls, and institute fairs. The Church was a handsome structure, 228 feet long and 52 feet wide, ornamented with an elegant tower at each end. The cloisters measured 100 feet square. Portions of the walls are still visible near the present Church, and the dormitory, fraytor, and all the other buildings, were on a scale of proportionable magnitude. The anicient mansion called the Abbey House is said to have been that part of the building which formed tbe private residence of the abbot, it is now occupied and held on lease by Thomas Thornewill, Esq., who has, at great expense nearly restored it to its pristine beauty, which had been destroyed by modern additions and repairs. The porter’s lodge is now converted into a blacksmith’s shop, and fragments of the wall which surrounded the abbey and its extensive gardens may still be seen. There are two other houses in the grounds, called the Priory and the Manor; the latter is occupied by the Marquis of Anglesey’s agent. The Parish Church, dedicated to Street Modwen, is a handsome structure with a fine tower and was built in 1720, on the site of the ancient Church, which had been greatly dilapidated during the parliamentary war. It has 8 bells, a set of musical chimes, and a good organ, erected in 1771. The Churchyard is now very spacious, 1½ acres of land on the margin of the Trent being added in 1830, by the Marquis of Anglesey. Several stone coffins have been dug up; one of which is placed in an upright position, on the margin of the Trent, and a lid ornamented with rude sculpture is placed against the wall on the south side of the Church. The Marquis of Anglesey is impropriator and patron of the living, which is a perpetual curacy, but is now called a vicarage, value £192; the Rev. Samual Stead, M.A., incumbent. Holy Trinity Church, Horninglow Street, is a beautiful edifice, in the florid Gothic style of architecture. It is partly built of brick cemented so as to correspond with the stone buttresses, pinnacles, and other ornamental portions of the building. The interior is exceedingly neat and has a richly foliated Gothic window of stained glass, with representa­tions of Street Peter and the four evangelists. It was built in 1824, by the executors of the late Isaac Hawkins, Esq., at a cost of £7,000, and will accommodate about 1,000 hearers; 700 sittings are free. There is an endowment of about £80 per annum from Queen Anne’s bounty, and from a small sum in the funds from other sources. The Marquis of Anglesey is the patron, and the Rev. Peter French, M.A., is the incumbent. Christ Church, New Street, is an elegant cruciform structure in the early English style, with a tower surmounted by an elegant spire. It was consecrated in September, 1844, and was built at a cost of £2,750, raised by private subscriptions and a grant from the In­corporated Society for building churches. It has 600 sittings on the ground floor, and 400 in the galleries, and the whole of the sittings both free and appropriated, have carved stall ends; but the latter have small low doors. The living is a perpetual curacy, value £200 in the patronage of the vicar, and the incumbency of the Rev. William Morgan, B.A., who resides at the parsonage, a neat house in the Tudor style, erected between the church and its schools. Catholic Chapel, Guild Streetreet, is a neat brick building, erected a few years ago, the Rev. Thomas Telford is the priest. Independent Chapel, High Street, occupies the site of a nonconformist meeting-house, built in 166l, when the Rev. Thomas Bakewell was ejected from the rectory of Rolleston. This chapel, however, was rebuilt about 80 years ago. The present edifice is in the Gothic style, and was rebuilt in 1842, at a cost of £2,200. The front is of hewn stone, and has a large window of beautiful proportions, filled with Gothic tracery which gives it a chaste and noble appearance. The interior fittings are all of oak, and it will seat 600 persons. The Rev. Daniel Horscraft is the pastor. The Wesleyan Chapel, Horninglow Street is a neat brick building, rebuilt in 1813; it is neatly fitted up with galleries, and the body of the chapel has been recently pewed; attached to it are two neat houses for the ministers. The Particular Baptist Chapel, Station Street, was erected in 1793, and was considerably en­larged and beautified with a Grecian portico, in 1842, at a cost of £1,150. The General Baptist Chapel, Burton Extra, was opened in 1825; Zion Chapel, (General Baptists) Union Street, was erected 1855; it is a handsome brick building, capable of seating 600 persons. The Primitive Methodist Chapel, Station Street, is a neat brick building, erected in 1829. And the Wesleyan reformers have a small chapel in George Sunday Schools are attached to all the churches and chapels, and are numerously attended. The Free Grammar School, Friar’s walk, adjoining the church-yard, was founded in 1520, by William Beyne, Abbot of Burton, who built a school house on ground belonging to the Abbey. The endowment consists of a farm of 120 acres at Orton-on-the-Hill, in Leices­tershire, let for £250 a year, and 111 acres of land at Breaston, let for £202 per annum. The head masteter receives two-thirds of the rents arising from the lands, and the second master one-third. The former has also £3, and the lattir £6 a year, from the bequest of Elizabeth Paulett. The school is free to sons of parishioners, with preference to those who apply for classical instruction. The number is limited to 65. The present school was built in 1834, atthe cost of £600. It contains an ancient carved oak desk, supposed to have been in use ever since the foundation of the school. The Rev. Henry Day is Head master, and Mr. Henry Hodson, second master. Allsopp’s Charity School is endowed with land now let for £24 per annum; left by Rd. Allsopp, in 1728, for the instruction of 30 poor boys. Six of the scholars are clothed out of the rents of the land now let for £6 a year, left by Francis Astle, in 1735. The feofees of the Town Lands are trustees of this school and the 30 poor boys are now instructed at the large and handsome National Schools, (Christ Church) Church street, erected in 1844, at the cost of about £1000. They form a handsome building in the Tudor style, and will accommodate about 400 children; the average attendance is 130 boys, and about the same number of girls, and 100 infants. The National Schools, (Holy Trinity) Horninglow Street, were built by subscription, in 1827, and are supported by voluntary contributions; about 100 boys and 70 girls receive instruction; and an Infant school was erected in 1846, by subscriptions, and a grant of £100 from the National Society, in Anderstaff Lane, the average attendance is about 95. The British Schools, Guild Streetreet, were built in 1843, on land given by the Marquis of Anglesey, at the cost of about £900, raised by subscriptions, and a Parliantentry grant of £274 12s. 19d. They are substantial buildings, and comprise a good house for the master and mistress, and two spacious rooms for about 160 boys and 100 girls. The Burton Literary Society, High Street, commenced in 1844, has a reading room and a library of about 1,100 volumes on various scientific and interesting subjects. It is supported by a subscription of 20s. per annum from the first class, and a quarterly subscrip­tion of 2s. 2d. from the second class, and 5s. per annum the third class. The former have the privilege of attending the reading room at all hours of the day, the other from 5 o’clock in the evening until 10; but the latter have only the use of the library. The reading room is well supplied with London and provincial newspapers, and the most popular periodicals of the day; Mr. S. Simnett, Secretary and Librarian. Natural History Society and Museum, High Street, established in 1842, contains a valuable collection of British and foreign birds, insects, fishes, fossils, minerals, and antiquities. This interesting exhibition is at all times open to the public free. The Self-supporting Dispensary, in High Street, is a valuable institution, established in 1830, by which means the poor have the best medical and surgical aid, for the small charge of a 1d. a week, and also the privilege of choosing their own surgeon. The total receipts for the year ending Oct. 31, 1855, was £657 7s. 6d. The disbursements £653 16s. 3d. Mr. Thomas Ash is the dispenser. The Savings’ Bank, established in 1818, is held at the Town Hall, which is open every Saturday, from 2 to 3 o’clock. The amount of deposits for the year ending 20th Nov. 1855, was £36,078 1s. 8d., and the number of depositors 1,352, of whom 24 were charitable and 29 friendly societies. The respective balances of 763 depositors did not exceed £20. 354 not exceeding £50, 131 not exceeding £100, 37 which did not exceed £150, 13 not exceeding £200, and 1 which exceeded that sum. William Coxon, actuary. The Permanent Library, at Mr. R. R. Bellamy’s, Bridge Street, was commenced in 1838; it is supported by a number of shareholders and upwards of 70 subscribers, and contains 2000 volumes. The shares are £10 each, and an annual subscription of 16s. Subscribers, not being shareholders, pay 21s. a year. Young Men’s Christian Association, Guild Streetreet, established about 11 years ago, has a reading room, and library containing about 1,400 volumes. Mr. John W. Lomas, Secretary. Petty Sessions are held every Tuesday, at the County Court House, and Police, Station, Station Street. The magistrates for the district are—Sir Oswald Mosley, Bart., Robt. John Peel, Esq., Michael Thomas Bass, Esq., M.P., John Bott, Esq., Charles Walter Lyon, Esq., and Henry Allsopp, Esq. Mr. Jno. Thornewill, clerk to the magistrates; Jno. Anderson, inspector of police; here are also two constables. The Stamp Office, High Street, is at Mr. Samuel Whitehead’s; it is open from nine to five o’clock. The Inland Revenue and Corn Returns’ Office, Market Place; Mr. Ambrose Martin, supervisor. The New Small Debts Act, or County Courts.This important act, which superseded the Court of Requests, came into operation on the 15th March, 1847. Burton-upon-Trent County Court is held at the Court House, Station Street, Monthly, and the district comprises the following places:Anslow, Barton Blount, Barton-­under-Needwood, Branstone, Bretby, Burton Extra, Burton-upon-Trent, Castle Gresley, Catton, Caldwell, Church Broughton, Church Gresley, Coton in the Elms, Drakelow, Dunstall, Egginton, Foston and Scropton, Hanbury, Hatton, Hilton, Hoon, Horninglow, Linton, Lullington, Marston-upon-Dove, Milton, Newton Solney, Osleston, Repton Rolleston, Rosliston, Stanton and Newhall, Stapenhill, Stretton, Sutton-on-the-Hill, Swadlincote, Tatenhill, Thurvaston (Upper), Tutbury, Walton-upon-Trent, Wichnor, Winshill. J. T. Cantrell, Esq., Judge Philip Hubbersty, Esq., Wirksworth and John Thornewill, Esq., Burton-upon-Trent, registrars. George Ley, High bailiff, Burton-­upon-Trent. THE BURTON-UPON-TRENT POOR LAW UNION, formed in 1837, comprises 53 parishes and townships, of which 40 are in Derbyshire and 13 in Staffordshire, with an area of 90,652 acres of land, and a population of 31,843 souls. The following is an enumera­tion of the parishes and townships in the county of Derby, viz: Ash, Barton Blount, Bearwardcote, Bretby, Burnaston, Castle Gresley, Catton, Caldwell, Church Broughton, Church Gresley, Coton-in-the-Elms, Dalbury with Lees, Drakelow, Egginton, Etwall, Findern, Foremark, Foston and Scropton, Hatton, Hilton, Hoon, Ingleby, Linton, Lul­lington, Marston-upon-Dove, Mickleover, Newton Solney, Osleston and Thurvastan, Rad­bourn, Repton, Rosliston, Stanton and Newhall, Stapenhill, Sutton-on-the-Hill, Swadlin­cote, Trusley, Twyford and Stenson, Walton-upon-Trent, Willington, and Winshill. The 13 parishes and townships in the county of Stafford are, Anslow, Barton-under-Needwood, Branstone, Burton-upon-Trent, Burton Extra, Dunstall, Hanbury, Horninglow, Rolleston, Stretton, Tatenhill, Tutbury, and Wichnor. The Union Workhouse, erected in 1839, is a handsome brick building, ornmented with stone, situated at the west end of Horninglow Street. It was erected at a cost of £8,300, and, with an additional sum of £700 expended for furniture, will make a total of £9,000. It contains ample accommodation for 400 inmates, and is well ventilated and supplied with fittings of the most substantial character. The present number of in­mates is 165. William Coxon in clerk and superintendent registrar; Alex. and Jane Phillips, master and matron; William Freeman, schoolmaster, and Emma Oakden, schoolmistress; Robt. R. Bellamy, registrar of marriages; John Killingby, relieving officer and registrar of births and deaths for the South district; Gervase Smedley, relieving officer, and registrar of births and deaths for the North district: Richard Stone, Esq., of Derby, auditor; and John Dawson, porter. The following is a list of the surgeons : Robert Shirley, Belcher, Burton-upon-Trent district; Robt. John Bell, Mickleover; Benjamin Miller, Barton-under-Needwood; George Ambrose Cope, Etwall; H. Edwards, Tutbury; George Lowe, Rosliston; Arthur Hewgill, M.D., Repton; and Spencer Thomson, M.D., Gresley district. The average weekly cost of the in-door paupers for the half-year ending March, 1856, was 2s. 5¾d. for food, and 3½d. for clothing. The Towns Lands consist of about 40 acres in small detached parcels, with several tenements, producing an income of £190 a year, including the rent of Finney’s close and the Workhouse garden. For a long period they have from time to time been conveyed together to trustees or feoffees, for the common benefit of the inhabitants of Burton. The feoffees are also entitled to the sum of £1,800, which has been accumulated from fines received on different renewals of leases for lives. The interest of this money, £84 a year, is applied with the other income. The rents of the town lands are collected by the town masters, (to whose office the constables of the preceding year, appointed at the Court-leet, succeed as a matter of course,) and are paid by them to the treasurer of the feoffees, at their general annual meeting, held annually on the 21st December. CHARITIES,(under the management of the feoffees of the Town Lands). Mr. Finney gave a close in Anderstaff Lane, and directed the rents to be given in apprenticing yearly some poor boy. The close is let for £11 18s. 8d. The Workhouse Garden, in Anderstaff Lane, is let for £5 8s. a year, in respect of which it had long been customary to furnish annually six coats for poor men, but the practice was discontinued about 30 years ago. The rent is carried to the general account of the town lands. The Pavement House consists of a messuage, shop, two cottages, and 36 perches of land, the rents of which are appropriated by ancient usage to the reparation of the pave­ment of the inferior inhabitants in High Street. The New Close is a piece of lands of about 20 acres, formerly part of the town moors. It is now let in leys or gates for depasturing cows, and the clear profits have been applied since 1815 for repairing the pavements in Burton and Bond End. Daniel Watson, in 1779, left a stable, coach house, and stable yard, in Cat street, and directed the rents to be given to the poor on Whit-Monday. Isaac Hawkins, in 1712, left £100 to be laid out in land, for the maintenance of some poor man in Burton. This legacy was expended in land called the Low Gate Piece, now let for £7 7s. a year. Mrs. Almond’s gift. There appears to be no original writings respecting this charity. It consists of a farmhouse and 30A, of land at Aston, a close 6A. 2R, called Blackwells, at Rolleston, and an allotment in Horninglow of 1A. 1R. 19P. The rents amount to £71 18s. 8d. In addition to the above, there belongs to this charity a part of certain lands in Rolleston, which were received in exchange from Sir Oswald Mosley, Bart., for land belonging to this charity. The annual value of this land was £2 2s. a year, but through mistake the rents have been carried since the enclosure to the account of Parker’s almshouses. Of the above rents, £5 17s. is paid for weekly distribution of bread; £6 6s. to the poor of Horninglow, Stretton and Branston, in sums of 3s. each and under; and £29 17s. to the poor of Burton and Burton Extra, chosen by the feoffees in sums of 5s. each. William Hawkins, in 1724, left a rent charge of £5 a year to be distributed in bread. This amount has for some time been paid, towards furnishing 12 poor women of Burton with gowns. Richard Steele left a rent charge of 21s. per annum, which is divided equally be­tween the poor of Burton, Branston and Stretton. Richard Caldwell, M.D., in 1582, left in trust with the bailiff of Lichfield £160, to be lent free of interest to clothiers of small wealth and ability, or else to other handicraft­men, dwelling in Burton-upon-Trent. The sum of £40 is lent from five years to five years, and the sum of £120 alternately, in four sums of £30, aud twenty of £6 for five years. The bailiffs of Lichfield go over to Burton at the time when the securities are to be renewed, and they receive applications for, and advance the loans. The Almshouses in the Swine market, for five poor women, were founded by Elizabeth Paulett, in 1591. The endowment consists of 25A. 1R. 22P. of land at Fenny Bentley, and several dwellings and shops adjoining the almshouses, producing an annual sum of £81 17s. The same donor also bequeathed a rent charge of £10 a year, of which £1 is given to the almswomen, and the remainder as noticed, with the Grammar school. The rent charge was exchanged in 1795, for £333 6s. 8d., three-per cent. consols. Each of the inmates receive 6s. per week, paid quarterly, and a supply of coals out of the rents of the town lands. Parker’s Almshouses, High Street, were founded in 1634, by Ellen Parker, who left £800 in trust to build 6 almshouses for 6 poor widows or old maids of Burton and Stretton. The property consists of buildings and land in Anderstaff Lane, Horninglow, and Rolleston, let for £54 5s. 3d. per annum. The inmates have each 4s. weekly, and about £6 added from the funds of the town lands. MISCELLANY, consisting of Gentry, Clergy, Partners in Firms, and others not arranged in the classification of Trades and Professions. Post Office, High Street; Mr. John Whitehurst, postmaster. Derby, Leeds, & Co., (1st mail) at 1 a.m., (2nd mail) at 11 a.m.
London and all parts, (1st mail) at 2 30 a.m., (2nd mail) at 1 p.m.
Birmingham, Tamworth, & Co., at 10 15 am. Derby, Leeds, & Co., at 12 noon. London, and all parts, at 10 p.m.
Money Order Office, open from 9 to 6 o’clock. Branch Post Office, at William Peace’s, Victoria crescent. ACADAMIES (Marked ** take Boarders). Trinity, Horninglow Street., Henry Taylor & Sarah Ann Gould. Savings’ Bank, Town Hall, (open every Sat, from 2 to 3); William Coxon, sec. BREWERS AND MALTSTERS (Marked ** are also Exporters). Anglesy Coal Co., Winshill; Bond, Brailsford, Hunt & Wigfall, proprietors. STONE MASONS (Marked * are Merchants). Worthington William & Son, (importers) High Street Railway Conveyance. Midland Railway Co.’s Station, Foot of Station Street. 4, Star; 5, White Horse; and 6, White Lion. 4 Appleby, J. Fish, Thurs. 1 Ashby-de-la-Zouch, Thomas Broadhurst, Thurs. 2 Barton – under – Needwood, Geary, Tu., Thur. & Sat. 3½ Barton-under-Needwood, Bakewell, Thur. & Sat. 1 Church Broughton, Joseph Jackson, Thurs. 3 Church Broughton, William Cooke, Thurs. 3 Coton, William Lester; Thurs. Derby, James Salt, from New Street, Mon., Wed. & Fri.
1 Hanbury, Jas. Burnan, Thurs. 1 Hatton, George, Locker, Thurs. 3 Newall, Thomas Taylor, Thurs. 1 Netherseal, John Mear, Thurs. 4 Repton, Maddocks, Mon. and Thurs. 3 Ticknall, Jas. Peace, Thurs. 2 Tutbury, Mayer, Mon. and Thurs. 3 Yoxall William Mosedale, Thurs. 3½ Yoxall, John Upton, Thurs. Anglesey Coal Company, Ashby Road, Bond, Brailsford, Hunt., and Wigfall, proprietors.